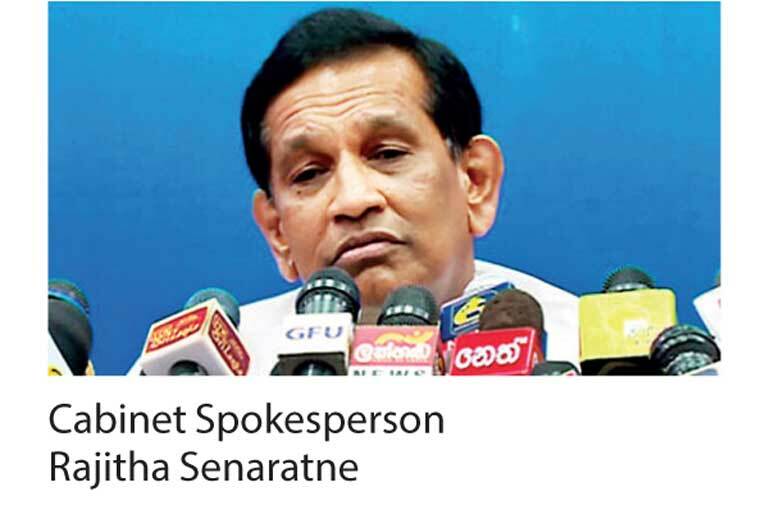 The National Unity Government will continue despite the deep crisis it has been plunged into but with major changes to the Cabinet composition, Cabinet Spokesperson Rajitha Senaratne assured yesterday. With his Sri Lanka Freedom Party (SLFP) Cabinet colleague and Co-spokesperson Dayasiri Jayasekara staying away from the cameras yesterday, Senaratne put on a brave face to solely answer queries from journalists regarding the future of the Government in the aftermath of the defeat at the Local Government polls. Dismissing claims that Jayasekara’s absence was due to his possible defection from the Government, Senaratne valiantly defended both the President and Prime Minister to portray a united front for the Government. The Minister played on the numbers and percentages to insist that the coalition partners United National Party and SLFP have retained their voter base while the Mahinda Rajapaksa faction exhibits a decline. “Our joint voter base remains the same but Mahinda’s group shows a decline,” he insisted. Senaratne claimed that the members of the coalition brought the defeat upon themselves as they resorted to criticising each other on the election stage but were quick to exonerate President Maithripala Sirisena of doing the same as he was “left with little choice as the leader of the SLFP”. “He had to criticise the political opponents of the SLFP. When Mahinda criticised Ranil, the President had to criticise him louder than that,” he claimed. The Minister showed little concern over the possibility of the SLFP forming its own government, assuring that UNP Leader Ranil Wickremesinghe would continue as the Prime Minister. Senaratne was of the opinion that the SLFP did not have the numbers to form a standalone government. He claimed that the UNP had the backing of minority parties, including the National Union of Workers, All Ceylon Makkal Congress and Sri Lanka Muslim Congress. “It is clear that we cannot work the same way and that is why there will be clear changes going forward, we have told the Prime Minister this time that we will appoint committees for all these issues such as SriLankan Airlines,” he said. “If we try to change the Prime Minister now it will at least take six months. That is what the Mahinda faction wants and we will not have a chance to govern before the presidential election in 2019,” he said. Considering the outcome of the Local Government polls as a red light, the Government will take immediate measures for a Cabinet reshuffle to ensure that the Government delivers on the mandate given by the people in 2015, Senaratne said. Engaging in self-criticism, Senaratne admitted that the Government had been unable to deliver on its promises during its three years but pledged that swift action would be immediately taken. “The people have clearly shown us that they are not after welfare and other benefits. They want us to stop corruption and take action against the culprits of murders and other violations,” he said. The changes have already been set in motion, he said, referring to the offer of resignation by current Law and Order Minister Sagala Ratnayake.